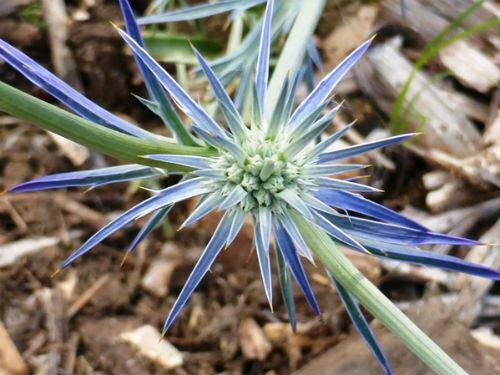 Eryngium ovinum is known as the Blue Devil and is a member of the Apiaceae family in company with the Flannel Flowers (Actinotus spp.) and the carrot. This would have to be the plant with the most unusual appearance in our cold climate garden. Eryngium ovinum is a perennial herb, which dies down during autumn and emerges in late winter to flower in summer. Plants have a fleshy tap root. In late winter the plant develops narrow, prickly leaves that are divided and form a rosette. The foliage has a waxy appearance. In early summer flowering stems appear. 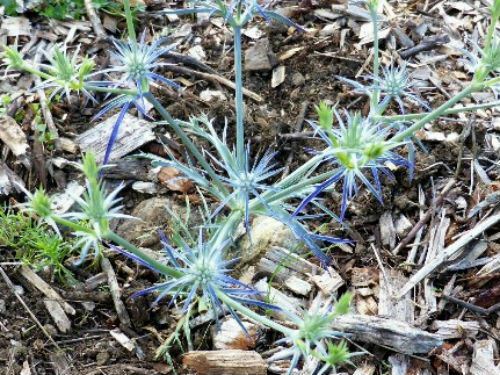 They are up to 60 centimetres long and produce masses of very unusual bright blue flowers with spiky bracts. The flower heads are similar in shape thistle flower heads. The vegetative parts of the plant are metallic blue. This coupled with the spiky appearance gives the species its common name. Blooms last for many weeks and are an impressive sight with their bright and unusual colour. Eryngium ovinum has a wide distribution in NSW and is also found in all mainland states, except Western Australia, and Tasmania. The Blue Devil would make an eye-catching addition to a cottage garden or rockery. The species is mentioned by Alan Cunningham in a paper On the Botany of the Blue Mountains published in Geographical Memoirs of NSW, 1825. Cunningham mentions that “Plants when young, much sought after by sheep in the plains around Bathurst”. This would account for the Blue Devil’s demise in grazed areas.